It was a Saturday night, I was exhausted from a whole day of being subjected to my wife’s list of honey-dos. Dinner was still up in the air. We decide to take the easy route and get some pizza. I called my order in, waited 15 minutes, and went to pick it up (I hate tipping the pizza delivery guy so I always pick up). When I get there the manager informs me that they made a mistake and they put olives and onions on my pepperoni pizza. I actually like those two ingredients so I would have been happy to let this one slide. The manager then informed me that they are making me a new pizza and that I can choose a 2-liter bottle of soda free of charge for my troubles. When the new pizza is done she calls my name and rings me up. The manger then proceeds to give me both large pizzas for the price of a small. I tried to tell her that this was not necessary but she insisted. I paid, and walked out the door with a smile on my face, two large pizzas, and a 2-liter bottle of soda. Customer Service and CUSTOMER SERVICE! That Dominos manager taught me the difference between good customer service and great CUSTOMER SERVICE. She knows that I could have gone to any number of pizza restaurants and received a tasty pizza and good customer service. She knows that the difference comes when they can provide great customer service. She could have easily informed me that there was a mix up with my order, they are making a new pizza, and it will be done shortly. I honestly wouldn’t have thought twice about it, but this manager knows better than that. She knew she had an opportunity to make Dominos stand out. She knew that if she could make that experience unique then I would come back, I would tell my friends, and maybe I would post it on social media, or write a blog post about it, or leave a review on Yelp. I like to think that she could see the surprise on my face when she rang me up. I like to think that she was celebrating inside by doing her signature Dominos Manager Touchdown Dance. How do you know if you are providing good customer service or great customer service? How do you measure the difference? The difference is measured in shock and awe. When a customer is surprised and receives something unexpected. Now, depending on where you work the customer service expectations vary. For example, at a dine-in restaurant there are certain standards that a customer can expect like, receiving a glass of water, clean plates and utensils, etc. Once the basic standards of customer service are defined for your job, you can then determine how to provide an unexpected experience for the customer. For example, if I were to go to Chili's and the chef arranged the mangos on my Mango-Chile Chicken in a smiley face, and the waiter massaged my shoulders while I ate said Mango-Chile Chicken, then I would consider that an unexpected experience. If I were into arranged food and shoulder massages then Chili's would have a loyal customer for life. Loyal customers are the gold at the end of the rainbow. Products and/or services can be revolutionary but can also be crippled by poor customer service. The moral of my story? 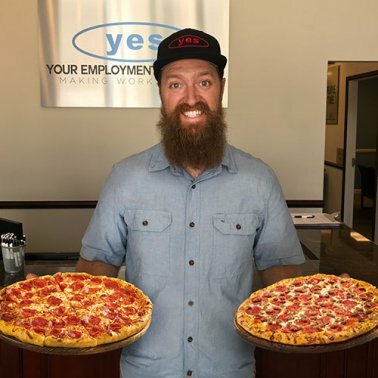 Whether you're offering pizza or staffing, the effort that is required to provide great customer service is minimal compared to how much it can impact the customer.